FiledRight securely stores and manages all your files - both electronic and paper. Store any desktop file or convert filecabinets full of paper to PDF or TIFF. When you edit your files, FiledRight maintains all the versions - regardless of who made them. Each of your business departments - Human Resources, Accounting, Customer Service - whatever functional areas you need - can have a separate and secure repository for their documents, with Indexing and Query screens optimized to use the information each employee needs to efficiently find, view, and edit their documents. A FiledRight system consists of two major software applications - a sophisticated server that interacts with an underlying relational database, and workstation software deployed on your users' desktops. The server, workstation, and database software are all included with your FiledRight system purchase. You provide a ScanSnap™ or other Fujitsu document scanner (if you need to digitize paper) and backup software. 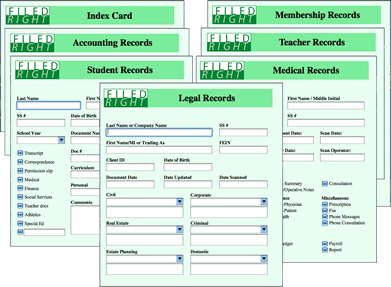 All documents managed by FiledRight are stored in repositories on the FiledRight Server. This can be a shared workstation, but is usually a dedicated Mac Mini or Mac Pro equipped with the needed storage capacity and backup hardware and software. The server interacts with the included Firebird™ database that contains records which refer to the stored documents. One of the primary tasks of the FiledRight Server is to ensure that each database record points to the correct document, and that these documents and records are maintained accurately and securely. FiledRight comes with a selection of prebuilt indexing and query screens that you can deploy immediately for common business areas. We also offer a custom screen design service that allows you to define your own indexing fields and logo graphics to meet whatever application requirements you may have. Refer to our Purchase page for details. Each screen represents the user's view of an individual repository - you may deploy as many screens as you need. Each repository can store any type of document or electronic file - PDF, TIFF, MS Word, Excel, or Powerpoint, etc. You can even store folders - the FiledRight workstation automatically zips the folder when stored and unzips it when retrieved, allowing you to store complex project folders such as those typically used with creative applications such as Adobe Illustrator - and retrieve the entire folder with a single query. If you have been using filenames and folders on a shared server, you know how difficult it can be to track changes to your documents. Did Sue remember to update the document on the server after she changed it? Did Bob rename the file to give it a new version number? These issues go away when the FiledRight server manages your versions. Each time you change and resave a document, the server creates and tracks the new file. Smart Versioning even protects against multiple people editing the same document at the same time. If the server detects that a document has been updated while you were working on it, you are given the opportunity to see the updates and decide which document will become the master copy. Users with system administrator privileges may also remove older versions and control which stored copy should be presented to users on retrieval. The FiledRight administrator assigns role-based security to each repository in the system. Privileges such as the ability to query, view, edit, create, or delete are easily managed. Each user is assigned a role (if any) with respect to the screen. This means, for example, that only those persons authorized see sensitive payroll and accounting information may do so. 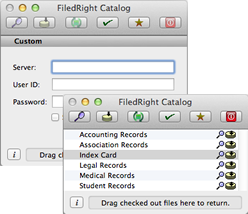 Read why FiledRight is more reliable than using folders and filenames. Read why FiledRight is faster and more accurate than using text search (such as Spotlight). Sample server configuration for a Mac Mini. Users log into the server with an assigned name and password. 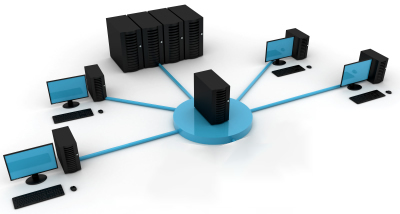 Large organizations can deploy multiple servers and users may log into as many as they need. Once connected, all of the query screens that the user is authorized to view are displayed. To perform a query, a user simply double-clicks on the desired repository, and the query screen for that repository is displayed. To file documents, users drag desktop files onto a repository in the catalog. 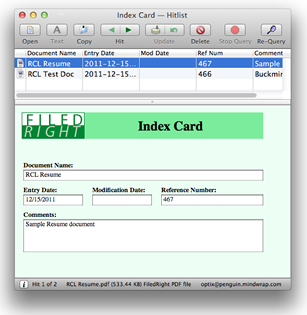 The indexing screen for that repository is displayed, allowing the user to enter applicable index data. The workstation then stores the file on the server and the new record is added to the database. Users that have edited a server file can quickly check them back in to the server by dragging and dropping them onto the return bar at the bottom of the catalog. Each time a document is edited, the server stores the new version and maintains all previous versions. Users input search data using information they already know - Accounts Payable could use an invoice number, Human Resources could use a applicant name or SSN - no need to change how you work. Whatever information allows your employees to find the documents they need can be built into a custom screen (or choose from any of our prebuilt screens). Users can also query using a wide variety of boolean search terms. Find documents limited to a specific date range, use wildcards in names or addresses, or provide input to more than one field to narrow your search quickly and return exactly what you need. The FiledRight server interacts with the underlying database and returns all records that match your query criteria, usually in less than a second. 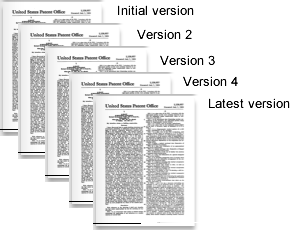 Double click on the record of interest and immediately view the associated document. PDF, TIFF, and other image files are displayed by the FiledRight workstation, using a familiar Preview-style controls. Zoom in, out, rotate, and side-by-side page viewing are easily and intuitively performed. Reorganize the pages in your document by simply dragging them where you want them. Delete a page by selecting it and pressing delete. Drag any page or group of pages and drop them on the desktop to export and create a new document. Drag TIFF or PDF or other image files off the desktop and drop them into your document to insert pages. FiledRight keeps track of which pages are PDF and which pages are Bitmaps (images) so that you always get the highest quality display. And when you are ready to save your document, save it as TIFF or PDF and FiledRight seamlessly does any required page conversions to meet your request. Cut or redact portions of any TIFF or PDF document. We understand redaction with respect to PDF documents - when a textual PDF page is redacted, we convert it from text to a bitmapped page with the redaction as part of the bitmap, thereby preventing anyone from "looking beneath" a redacted PDF area. Configure your scanner settings to match your documents. Create custom paper sizes. Scan black and white office documents or fancy full-color brochures at the resolution you need. Even scan doubled-sided documents in a single pass (on most scanners). FiledRight remembers and reuses as many different setups as you care to create. You aren't limited to simple scans, either. Filter out blank pages. Despeckle dirty images or clean up margins. 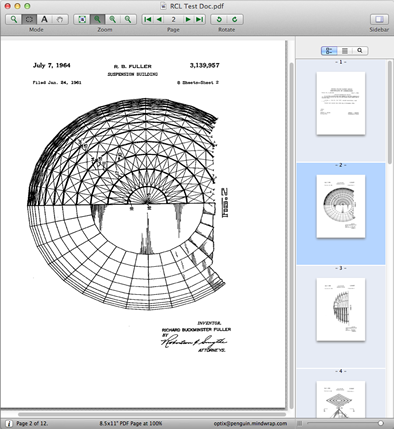 Rotate landscape pages on the fly and deskew your document to prepare it for subsequent OCR. 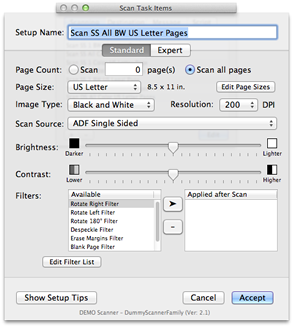 Run as many filters as you want - automatically - on each page scanned to achieve optimum readability and appearance. FiledRight comes complete with support for Fujitsu's ScanSnap™ scanners with support for additional scanners available. See our supported scanner list. Do ad-hoc interactive scanning to meet occasional conversion needs or create a Scan Task for heavyweight jobs. 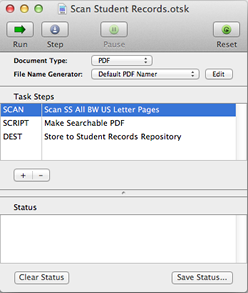 Our Scan Tasks automate the drugery of digitizing your paper documents. Drag Scanner setups, Scripts, and Destination setups into a new Scan Task to create a scanning workflow that gets your documents onto the server quickly and easily. In addition to targeting server repositories, Destinations may be created to send documents to FTP folders, Print, Fax, or E-mail. Save Scan Tasks for easy reuse anytime. FiledRight lets you create and print barcoded Patch Cards that you can insert into your documents and document batches during scanning. Patch Cards tell FiledRight where variable-length sections of your document end and separates multiple documents that you stack into the scan hopper. Put 50 invoices into the hopper with Patch Card separators, press the scan button, and watch FiledRight do all that boring repetitive stuff for you.